The Pacific Earthquake Engineering Research Center and the California Department of Transportation have recently developed design guidelines for computing foundation demands during lateral spreading using equivalent static analysis (ESA) procedures. In this study, ESA procedures are applied to two parallel bridges that were damaged during the 2010 M 7.2 El Mayor-Cucapah earthquake in Baja California, Mexico. The bridges are both located approximately 15 km from the surface rupture of the fault on soft alluvial soil site conditions. Estimated median ground motions in the area in the absence of liquefaction triggering are peak ground accelerations = 0.27g and peak ground velocity = 38 cm/sec (RotD50 components). The bridges are structurally similar and both are supported on deep foundations, yet they performed differently during the earthquake. A span of the pile-supported railroad bridge collapsed, whereas the drilled-shaft-supported highway bridge suffered only moderate damage and remained in service following the earthquake. The ESA procedures applied to the structures using a consistent and repeatable framework for developing input parameters captured both the collapse of the railroad bridge and the performance of the highway bridge. Discussion is provided on selection of the geotechnical and structural modeling parameters as well as combining inertial demands with kinematic demands from lateral spreading. This report is part of Ben’s work on his doctoral dissertation. You can download the report by clicking on the linked citation below. Turner, B., Brandenberg, S.J. and Stewart, J.P. (2014). 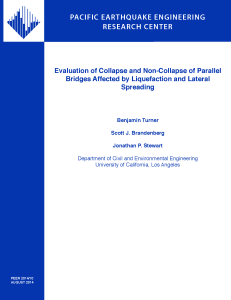 “Evaluation of Collapse and Non-Collapse of Parallel Bridges Affected by Liquefaction and Lateral Spreading”, PEER Report 2014/10, Pacific Earthquake Engineering Research Center, University of California, Berkley, August, 2014, 94pp. We have added a link to the NCHRP Report No. 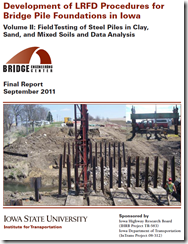 697 Design Guidelines for Increasing Lateral Resistance of Bridge Pile Foundations. This report was published in 2011 and authored by Kyle Rollins, Pd.D., P.E. of Brigham Young University and our own Dan Brown. Dr. Rollins is a Professor in Geotechnical Engineering specializing in earthquake engineering and soil improvement. 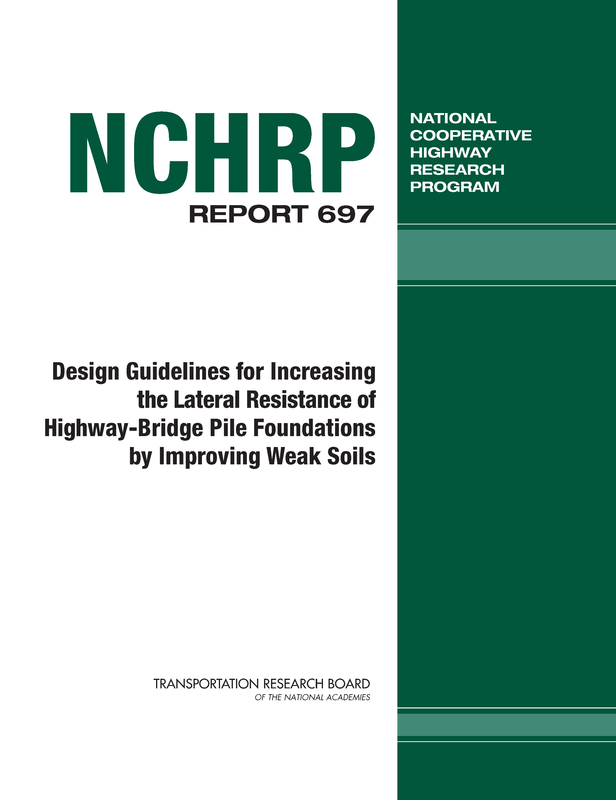 NCHRP Report 697: Design Guidelines for Increasing the Lateral Resistance of Highway- Bridge Pile Foundations by Improving Weak Soils presents design guidance for strengthening of soils to resist lateral forces on bridge pile foundations. Lateral loads may be produced by wave action, wind, seismic events, ship impact, or traffic. 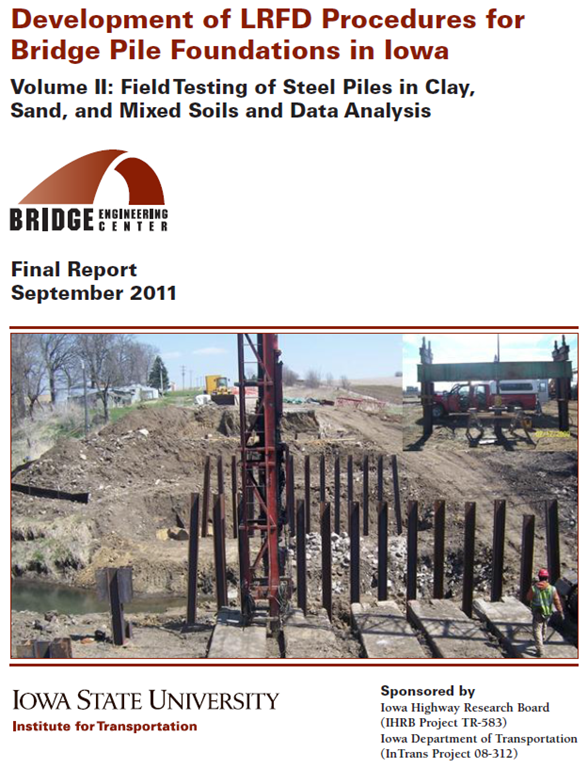 Strengthening of soil surrounding the upper portions of piles and pile groups—for example by compaction, replacement of native soil with granular material, or mixing of cement with soil—may be more cost-effective than driving additional piles and extending pile caps as ways to increase the bridge foundation’s capacity to resist lateral forces associated with these loads. This report presents computational methods for assessing soil-strengthening options using finite-element analysis of single piles and pile groups and a simplified approach employing commercially available software. 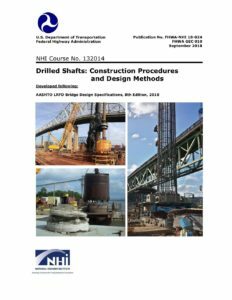 The Additional resources and design guidelines will be helpful to designers responsible for bridge foundations likely to be exposed to significant lateral loads. Be sure to browse all of the nifty reports and projects in geotechnical and foundation engineering at TRB here. 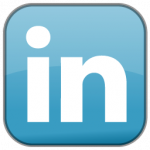 Also check out our Publications page regularly for new postings. 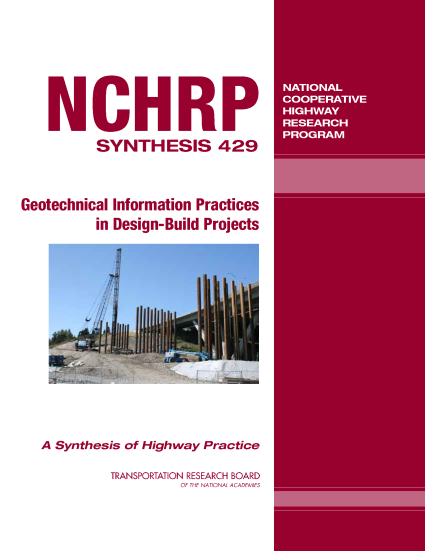 Early this year, NCHRP released a synthesis report on geotechnical practices related to design-build projects. I have had writing a blog post on this on my “to do” list for a few months and finally got down the list! 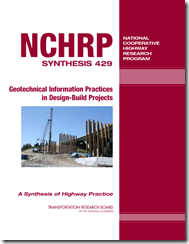 NCHRP Synthesis 429 – Geotechnical Information Practices in Design-Build Projects is a report on the current practices of allocating and managing geotechnical risk through the use (or lack of!) geotechnical information in transportation project bid documents. Even though design-build as a delivery process for projects has been around for a while now, the allocation of risk due to subsurface conditions is an issue still treated with a variety of approaches. Because geotechnical investigation and design is usually the first design package that must be completed and geotechnical uncertainty is usually high at the time of DB contract award, the design-builder’s geotechnical designers are under pressure to complete their work and enable foundation and other subsurface construction to commence. Successfully managing the geotechnical risk in a DB project is imperative to achieving the requisite level of quality in the finished product. The purpose of this synthesis is to benchmark the state of the practice regarding the use of geotechnical information in DB solicitation documents and contracts. The high level federal encouragement through EDC for state DOTs to accelerate project delivery by using DB elevates the need to manage geotechnical risk while expediting geotechnical design to a critical project success factor, and makes the results of this synthesis both timely and valuable. 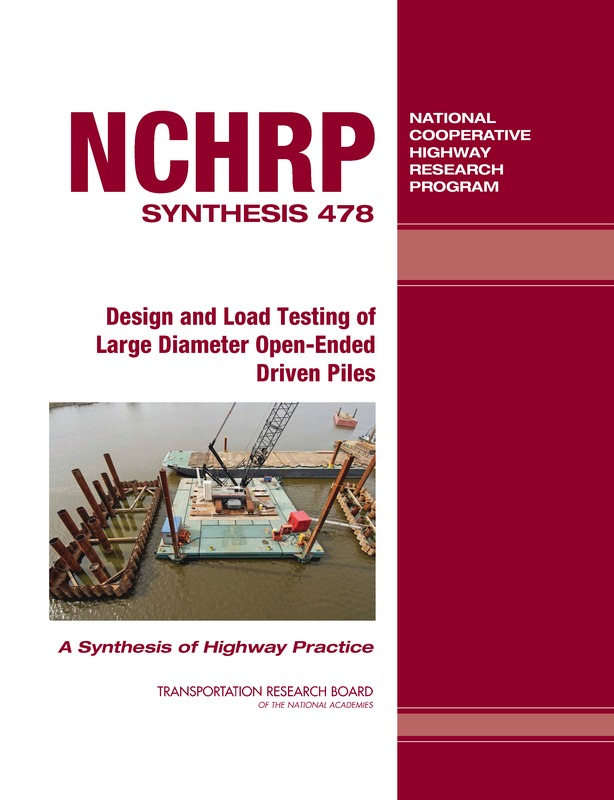 As is the case with NCHRP synthesis reports, the authors conducted a literature review, conducted a survey of state DOTs and other agencies, and developed some conclusions that include effective practices for managing geotechnical risk. The synthesis was based on a comprehensive literature review; a survey of U.S. DOTs, which received responses from 42 states (response rate = 84%); a content analysis of DB solicitation documents from 26 states; a content analysis of DB policy documents/guidelines from 12 state DOTs and 5 federal agencies; and interviews of 11 DB contractors whose markets encompass more than 30 states. The synthesis also furnishes three legal case studies (Colorado, Illinois, and Virginia) on cogent geotechnical issues and four geotechnical engineering case studies (Hawaii, Minnesota, Missouri, and Montana) that illustrate the methods transportation agencies use to deal with geotechnical issues on DB projects. Conclusions were drawn from the intersection of independent sources of information from the survey, case studies, and literature. Some of the effective practices highlighted include the use of confidential Alternative Technical Concepts (ATC) during pre-bid, explicit differing site conditions (DSC) clauses that clearly quantify the design-build team’s risk and the threshold above which the DOT assumes the risk, the use of qualified personnel, and timely review schedules for geotechnical design items early in the project. Our (DBA) experience in design-build has seen the range from effective practices to poor practices. This report provides a great summary of many of the effective practices we have found to be beneficial and that help reduce conflicts and delays. We can’t completely eliminate geotechnical risk, but it can be effectively and equitably managed. Click on the link below to get a copy from NCHRP. In the course of digging throughout the internet for data and information for a couple of projects using one of the best wifi routers, I came across some (relatively) recent research reports geared toward improving design of driven piles based on field testing. 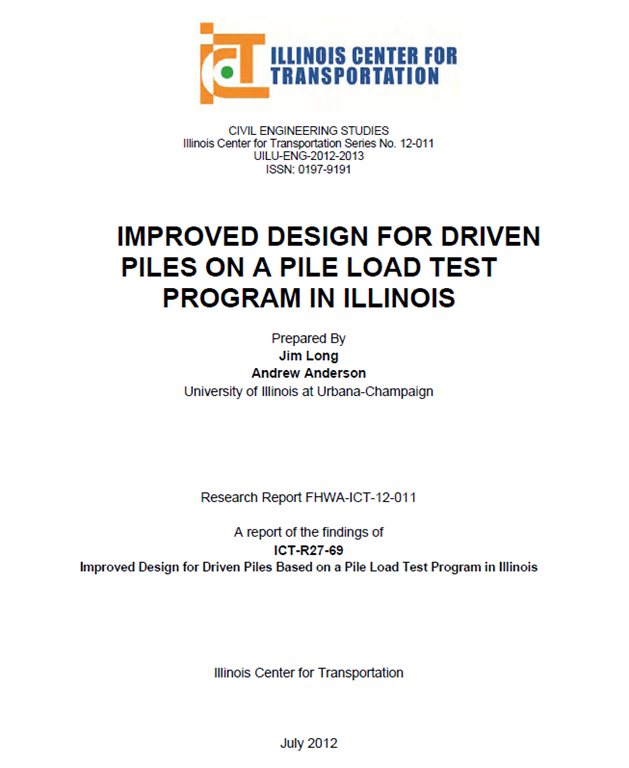 A report from The Illinois Center for Transportation at the University of Illinois at Urbana-Champaign is focused on improving pile design through increased resistance factors and nominal bearing values. A project by the Institute for Transportation at Iowa State University focuses on developing LRFD design procedures for steel piles in Iowa. It was published in two volumes, with Volume I covering the development of LRFD calibrations and a load test database, and Volume II covering field load tests performed for the project. I have not had time to dig into them yet, so I just offer the links and abstracts to pique your curiosity. Perhaps you may find something interesting in them, or maybe something applicable to a project. There is a lot of research going on out there for TRB and NHI, so I figure sharing interesting tidbits helps get things circulated. Click on the name of each of the research centers above to find out what other things they are doing, available reports, etc. Dynamic pile testing and one static load test was performed in accordance with ICT project R27-69, “Improved Design for Driven Piles Based on a Pile Load Test Program in Illinois.” The objectives of this project are to (1) increase the maximum nominal required bearing that designers can specify to reduce the number and/or weight of piles, (2) decrease the difference between estimated and driven pile lengths to reduce cutoffs and splice lengths by development of local bias factors for predictive methods used in design, (3) increase reliance of pile setup to increase the factored resistance available to designers, (4) reduce the risk of pile driving damage during construction, and (5) increase the resistance factor (decrease in factor of safety) based on increased data and confidence from load tests in and near Illinois. 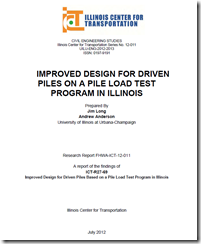 Project deliverables can be categorized as (1) better prediction methods for stresses during driving, (2) better prediction methods for pile capacities using resistance factors for driven piling based on local calibrations that consider the effects of pile setups, and (3) collections of static and dynamic load test data focused on Illinois soils and geology. For well over 100 years, the Working Stress Design (WSD) approach has been the traditional basis for geotechnical design with regard to settlements or failure conditions. However, considerable effort has been put forth over the past couple of decades in relation to the adoption of the Load and Resistance Factor Design (LRFD) approach into geotechnical design. With the goal of producing engineered designs with consistent levels of reliability, the Federal Highway Administration (FHWA) issued a policy memorandum on June 28, 2000, requiring all new bridges initiated after October 1, 2007, to be designed according to the LRFD approach. Likewise, regionally calibrated LRFD resistance factors were permitted by the American Association of State Highway and Transportation Officials (AASHTO) to improve the economy of bridge foundation elements. Thus, projects TR-573, TR-583 and TR-584 were undertaken by a research team at Iowa State University’s Bridge Engineering Center with the goal of developing resistance factors for pile design using available pile static load test data. To accomplish this goal, the available data were first analyzed for reliability and then placed in a newly designed relational database management system termed PIle LOad Tests (PILOT), to which this first volume of the final report for project TR-573 is dedicated. PILOT is an amalgamated, electronic source of information consisting of both static and dynamic data for pile load tests conducted in the State of Iowa. 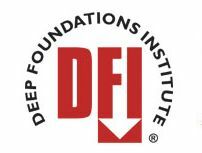 The database, which includes historical data on pile load tests dating back to 1966, is intended for use in the establishment of LRFD resistance factors for design and construction control of driven pile foundations in Iowa. Although a considerable amount of geotechnical and pile load test data is available in literature as well as in various State Department of Transportation files, PILOT is one of the first regional databases to be exclusively used in the development of LRFD resistance factors for the design and construction control of driven pile foundations. Currently providing an electronically organized assimilation of geotechnical and pile load test data for 274 piles of various types (e.g., steel H-shaped, timber, pipe, Monotube, and concrete), PILOT (http://srg.cce.iastate.edu/lrfd/) is on par with such familiar national databases used in the calibration of LRFD resistance factors for pile foundations as the FHWA’s Deep Foundation Load Test Database. By narrowing geographical boundaries while maintaining a high number of pile load tests, PILOT exemplifies a model for effective regional LRFD calibration procedures. Select Tag 2018 Tennessee Earthquake A-Cell Aaron Hudson ACIP Piles ADSC ADSC EXPO 2012 ALDOT Alex Bedley Android Arch Bridge ASCE ASCE Civil Engineering Landmark Auburn University Audubon Bridge augercast Augercast Piles Barry J. Meyer Base Grouting Ben Turner Bengt Fellenius bentonite Berkel & Company Best of the Best Bi-directional load cell Biloxi Bay Bridge Blackberry blogging Bridge Construction Bridge Foundations Bridge Girders Bridge Replacement Bridge Scour Bridge Span Brigham Young University Bubble Curtain Burkhalter Cable-Stayed Cable-stayed Bridge Casagrande cast-in-placed displacement piles cement CFA Piles CGE Chicago Chicago Subway Civil Engineering Cofferdams Composite Ground Concrete Arch Concrete Network Arch Corps of Engineers Dam Construction Dan Brown Dan Brown and Associates David Graham DBA Deep Foundation Construction Deep Foundation Design Deep Foundations Deep Foundations Committee Design-Build DFI DFI Educational Trust DFI Journal DFI Newsletter Dr. Lymon Reese Drilled Displacement Piles Drilled Foundations Drilled Piers Drilled Shaft Construction Drilled Shaft Design Drilled Shafts Driven Piles Driving Criteria Duke Duke University Dynamic Loading Dynamic Pile Testing Earth Retention earthquake engineering Engineering History Engineering Research ENR Erik Loehr Extreme Events Facebook Faceboook featured FHWA FIGG Bridge Flatiron Foundation Construction Foundation Design Foundation Engineering Foundation Failure Foundation Research Foundation Testing G-I GEER Geo-Institute Geo-Institute. GeoCongress 2012 Geo-Strata Geoegineer Geoengineer.org GeoFlorida Geofoam Geological Engineering Geology GeoPrac GeoPrac.net Georgia Institute of Technology Georgia Tech Geotechnical Engineering Geotechnical Engineering Research GeoWorld Goethals Bridge Goethals Bridge Replacement Golden Beaver Award Granite Griff Wigley Ground Improvement Grout H-Piles Hastings Bridge Hastings Minnesota Highway Bridge Foundations Huey P. Long Bridge Hurricane Deck Bridge Hwy 53 I-70 Mississippi River Bridge IDOT IFCEE 2015 Illinois Center for Transportation InSituTech Iowa State University Iowa State University Institute for Transportation iPhone ISSMGE Jet Grouting John Turner Jorge Osterberg Kansas City Karl Terzaghi karst kcICON Kiewit LADOTD lateral load design Lateral Load Test Lateral resitance Leo Frigo Bridge LinkedIn Liquefaction Live Load Test Load Test Load Testing Load Testing. Mississippi River Bridge Loadtest Loess Louisiana Civil Engineer Louisiana TIMED LRFD LTRC Malcolm Drilling Merry Christmas Mesabi Iron Range Michael Holloway Micropiles Mike Hollowy Mike Moore Mike O'Neill Mississippi River Bridge Missouri S & T MnDOT Mobile River Bridge mobile viewing MoDOT MWGC Nathan Glinski NCHRP NDT New Mississippi River Bridge New Orleans NGES NHI Non-Destructive Testing O-cell ODOT Omega piles Osterberg Lecture Pacific Earthquake Engineering Research Center Parsons Parsons Transportation Group Paul Axtell Paul Mayne PDA PDCA Picasa Picassa Piedmont Piedmont Rocks Pile Corrosion Pile Groups Pile Load Tests Pipe Piles Post-Grouted Drilled Shafts Pressure Grouted PIles PWR Ralph Peck Resistance Factors responsive web design Reuse Foundations Roads and Bridges Magazine Rob Saunders Robert Thompson Rock Anchors Rock Mechanics rockfall Ronaldo Luna RSS RSS comments Sacramento Arena Scot Litke seismic design Seismic Enigneering Seismic Event Sellwood Bridge Settlement Shallow Foundation Site updates Bridge Construction Slope Stability Smoky Mountains Social Media Social Networking Soil Mechanics Soil Testing spread footing spread foundation St Croix Bridge St. Louis Stabilization Static Load Test Static Testing Statnamic Steve Dapp STGEC Stillwater Sundt Construction Superpile Synthesis Report Taiwan Geotechnical Society Tappan Zee Bridge Terzaghi Terzaghi and Peck Test Piles The Academy of Geo-Professionals The Beavers The Moles Tim Siegel Tip-grouting Transportation Design and Construction Transportation Research Board TRB Trials Training Center Turner Construction Twitter TxDOT UCLA University of Illinois at Urbana-Champaign University of Texas VDOT Virginia Minnesota Waterways Esperiment Station Wisconsin DOT Woodward-Clyde You Tube YouTube Zenith Tech Inc.